It is well known that coronary flow is proportional to myocardial oxygen consumption, resulting in a nearly constant arterial-venous oxygen concentration-difference over a wide range of cardiac work rates. To assure adequate oxygen delivery to the cells, the control of coronary blood flow occurs by an, as yet, undefined mechanism that senses local oxygen concentration, a phenomenon first described in 1925 by Hilton and Eichholtz. We have proposed previously that mitochondrial oxidative phosphorylation is an oxygen sensor linking myocardial oxygen consumption to coronary flow (Nuutinen et al, 1982; Nuutinen et al, 1983; Starnes et al, 1985). It was argued that the vasodilatory responses to metabolic inhibitors (amytal, dinitrophenol) or to alterations of substrate utilization were a result of metabolic changes occurring in the cardiac myocytes from which a message was somehow sent to the coronary vasculature. It could not be ruled out, however, that similar metabolic alterations transpired within the cells of the vasculature. In the latter case, vasoactive mediators are now known to be released from endothelial cells and these effectors may be important in the regulation of blood flow. On the other hand, the oxygen concentration will likely be greater within the cells of the vasculature than in the cardiac myoctes of the intact heart. 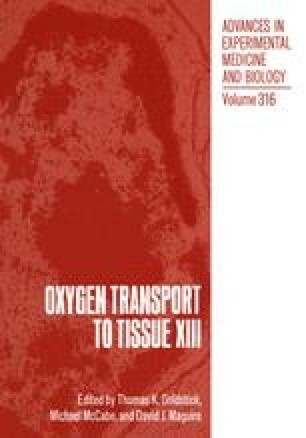 Since it is now widely believed that the mechanism responsible for sensing local oxygen concentration in the heart and adjusting coronary vascular tone involves mitochondrial oxidative phosphorylation (Olson & Bunger, 1987; Spades & Bardenheuer, 1986), we have measured the oxygen dependence of respiration in isolated cardiac myocytes and compared these measurements to those made with cell types not of cardiac origin.